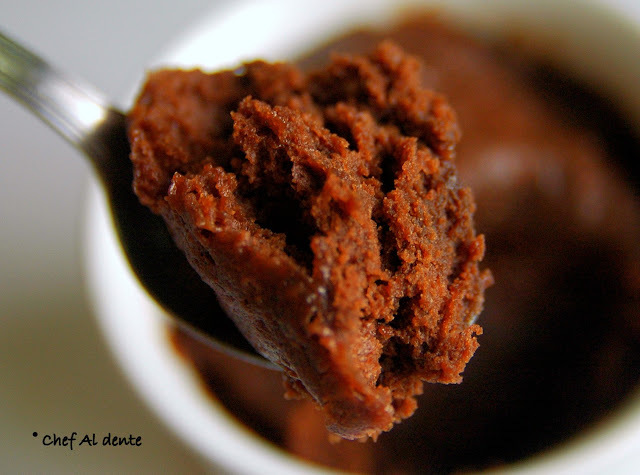 Chef Al dente: Chocolate Cake in a Jiffy! Chocolate Cake in a Jiffy! Came across this fantastic recipe on Charul's Tadka Masala (excellent blog by the way!) and found it hard to believe that you can actually make a chocolate cake under a minute!!! We just finished a scrumptious meal and were craving for something sweet. But as usual I had drained most of my energy into cooking main course that there was barely any left for an elaborate dessert - at least not for baking. Oh no! Unlike the original recipe, I used Nestle Aero drink instead of Oreo cookies and it still came out chocolaty and delicious. Definitely going to experiment more with this recipe to find out what other flavours I can come up with :) Of course, the cake is made in a very brief time (unlike normal cakes) so do not expect a stupendous, rich, airy cake! It is a dense, fudgy cake and is definitely delicious especially when served with ice cream. Yumm....!! In a ramekin or a large coffee mug, mix the dry ingredients - flour, sugar, cocoa, Aero, baking powder and salt. Remove any lumps. Then add the vanilla extract, oil and milk and stir well to get a smooth batter, It will be slightly thicker than normal cake batter. Microwave at high for 1 minute and your cake should be ready. Insert a toothpick at the centre. If it comes out clean then it is ready. Otherwise bake for few more seconds. Couple of pointers: Make sure that the ramekin or mug is microwaveable. Also it should be filled only half so that there is enough space for the cake to rise. Looks so moist, feel like grabbing that spoon right off the screen..
OMG Rosh, you have no idea how happy I am to see myself here. :) Love your blog. And me is a proud follower now. Thanks a lot for trying the recipe and linking it. Just like you, my eyes were glued to the oven to see whether the cake rises or not. It is a different feeling altogether to hold a nice and perfect cake, one minute cake or one hour cake, doesn't matter! When I made this 2-minute microwave cake first time last year, I was still doubting whether cake can really 'bake' within 2 minutes!? So I microwaved for some 3-4 minutes. After it cooled down it was as good as a stone. Hehe.